Komang Marhaeni lives in the front of our compound and runs this great little Warung and Cooking School in the RIce Field next to the family Organic Farm. You can order a nice fresh organic juice or sign up for the Cooking Class. Class size limited, sign up at least a day ahead and come hungry. Wi-Fi available. 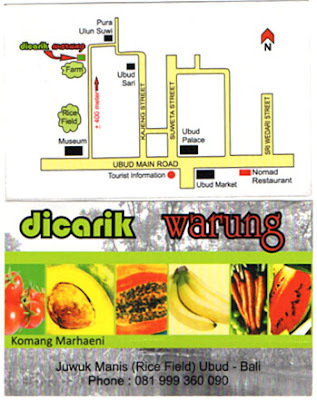 Map and Phone Number to Dicarik Warung and Cooking School. Hi, my family and I ate at Dicarik warung in August when we were in Bali and loved it. Strongly recommend it. I've tried to write a review on TripAdvisor for it, but its not even listed there.